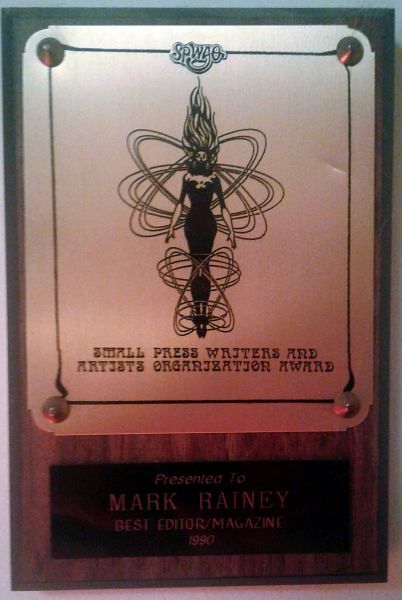 In 1990, the Small Press Writers and Artists Organization (SPWAO) awarded the Best Magazine Award to Deathrealm. 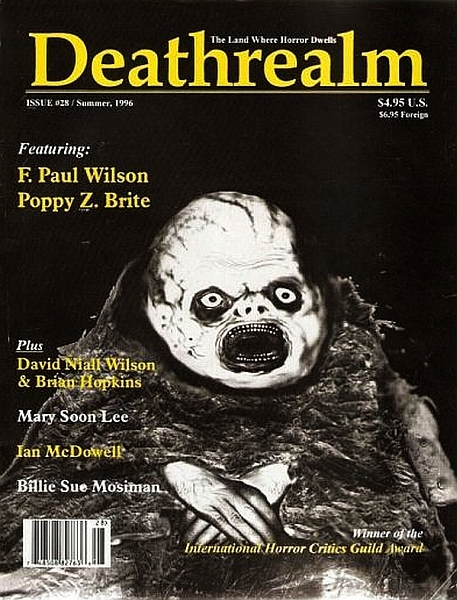 In the early 90s, the organization changed its name to Small Press Genre Assocation (SPGA) to be more inclusive of other media, and in 1994, Deathrealm again won their Best Magazine Award. 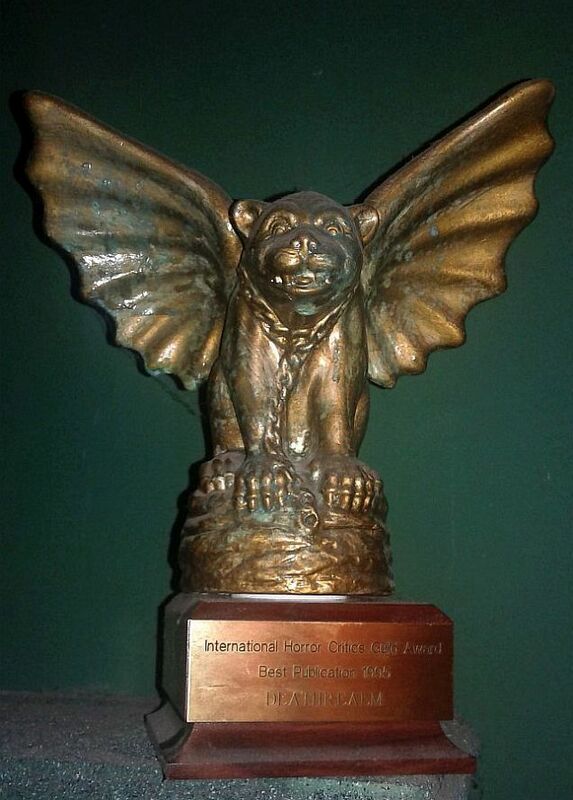 The following year, the newly formed International Horror Guild awarded Best Publication of 1995 to Deathrealm at the World Horror Convention in Eugene, Oregon. 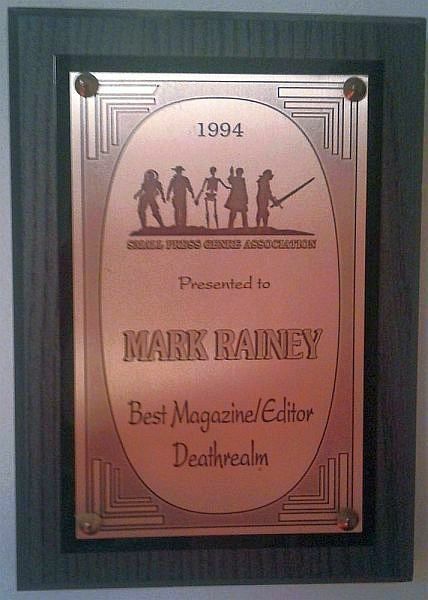 The Deathrealm Awards existed for only two years, but they did succeed in drawing considerable attention to both the award winners and the magazine itself. When Deathrealm closed its doors in 1997, I had no illusions about it ever rising again from the dead. While I dearly loved the magazine—and being recognized in the horror community as "Mr. Deathrealm"—the burden of it during that last year or so was crushing. When I wasn't at my day job, I was spending most of the rest of my waking hours playing collection agent, trying to get distributors and book dealers to pay the often substantial amounts they owed. Distributors certainly had some creative accountants, and it may be that dealing with them in 1996 and 1997 is why I lost my hair and developed high blood pressure. For a full two years after Deathrealm's demise, I continued to receive almost as many submissions by mail as I had during the magazine's heyday. Any number of hopeful writers urged me to hold onto their manuscripts "just in case" Deathrealm might be resurrected yet again. Even three, four, and five years later, though the quantity tapered off, I still regularly received fiction submissions and queries. At one point, I had to convince one aspiring writer that the magazine really was closed, that I wasn't just trying to put him off. A year or so prior to Deathrealm's cancellation, a publisher by the name of Tangram expressed an interest in releasing a Best of Deathrealm anthology, and the proprietor and I set about making the project happen. Contracts were signed, writers were notified, payments were promised. In its relatively short lifetime, Tangram had produced some high-quality work, but as time went on, communication became more and more infrequent. Calls were not returned. At last, mail to Tangram began bouncing back to me, and it was clear that this project, as great as it had promised to be, was not going to happen. Tangram, as a publisher, was never heard from again. The anthology, however, was not as dead as the magazine. 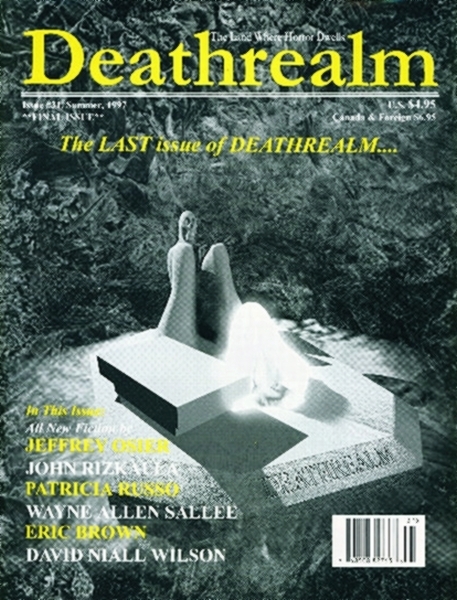 In 2004, Shane Staley, owner of the prestigious Delirium Books, agreed to publish a signed, limited-edition hardback titled Deathrealms, a collection of stories from the magazine. It turned out to be a gorgeous book indeed, featuring 15 stories from various issues of the magazine, with striking cover art by Mike Bohatch. While many may have called it a "Best of" volume, my personal feeling, which I conveyed in the editorial, was that the book was not truly a best-of, but more a representative sampling of the stories that I felt defined the magazine's character over the years. And that, I suppose, brings us back around to the first entry of this little blog series ("That Which Is Not Dead... Part 1"). For some time, I've been wanting to write up something that might pass as the "definitive" history of Deathrealm, since there's not that much about it to be found online these days, twenty whole years after the final issue hit the street. The magazine—the experience—for all its hard work and hard lessons, is one I wouldn't have traded it for anything. I'm confident Deathrealm has earned a respectable place in the annals of fiction magazines, and I hope it will be remembered even when I have shuffled off to the Black Lodge, or wherever it is that old horror writers/editors shuffle off to. I hope you've enjoyed these musings of mine, which I hope to preserve for posterity—or at least for me later in life. Who knows... there may come a time I won't remember any of this. After Stan Tal and I decided in 1994 that retiring Deathrealm was for the best, I had few hopes that it might play phoenix from the ashes a second time. But Tal did put the word out that interested publishers ought to inquire, and that's exactly what happened. Well, almost. In these golden olden days, the online network GEnie—one of the precursors to what we know today as social media—had brought together writers from every field, with forums and chat rooms that quite a few of us put to substantial use. Through GEnie, I had gotten to know Lawrence Watt-Evans (author of The Lords of Dus series, the Legends of Ethshar series, a couple of Star Trek novels, and a host of other H/F/SF series and novels). Having heard of Deathrealm's apparent demise, Lawrence—or LWE (pronounced "Louie") as he was often known—expressed some interest in stepping in as a possible publisher. At the same time, screenwriter Terry Rossio (The Puppet Masters, Pirates of the Caribbean, Aladdin, Shrek, and many others, including the upcoming Godzilla vs. Kong), who was also a Deathrealm subscriber, contacted me stating a similar interest. With both individuals interested in keeping Deathrealm from its entering final resting place, it was only natural for LWE and Terry to schedule a meeting of the minds, which eventually resulted in a conference call between the three of us. And at the end of it, the deal was done. Somewhere in the conversation, LWE and Terry figured the partnership would need an official company name, and I jokingly tossed out "It ought to be dark but kind of warm and fuzzy. Something like 'Malicious Press.'" I had never intended that to be serious, but both of them thought it was just the ticket. So, Malicious Press was born. In this arrangement, LWE and Terry were totally silent partners, while I took over not only the editing and production work, but once again the whole sheboygan—sales & marketing, accounting, promotion, you name it. I tell you, I knew I had my work cut out for me to make this thing succeed. But Deathrealm was once again alive. I immediately set to work putting together a new issue, keeping the best features from the Tal days, such as Karl Edward Wagner's "View From Carcosa" column, but shifting the focus once again to less noisy, more subtle horror fiction. At the time, Karl Wagner held what he believed to be the last unpublished story by the late, celebrated North Carolina author Manly Wade Wellman, a piece titled "The Finger of Halugra," which he had planned to run in an anthology that never came about. He offered it to Deathrealm, and so it became the centerpiece for issue #23. In the spring of 1995, the issue came out with something akin to great fanfare. Now, prior to the issue's release, I had advertised that it would feature the last known unpublished story by Manly Wade Wellman. Early one morning before heading to work, I was taking my customary shower when my wife hollered to me, "Mark, Harlan Ellison is on the phone for you." "No. No, he isn't," I said. Yes, he was. Imagine my surprise when he told me that he, too, had an unpublished story by Manly Wade Wellman for The Last Dangerous Visions, and he wanted to find out which story I had in my possession. When I informed him that it was "The Finger of Halugra," his relief was palpable, for that could have been a complicated situation indeed. And all was happily resolved (although, to date, The Last Dangerous Visions, featuring Manly Wade Wellman's "Not All a Dream," has yet to see daylight). 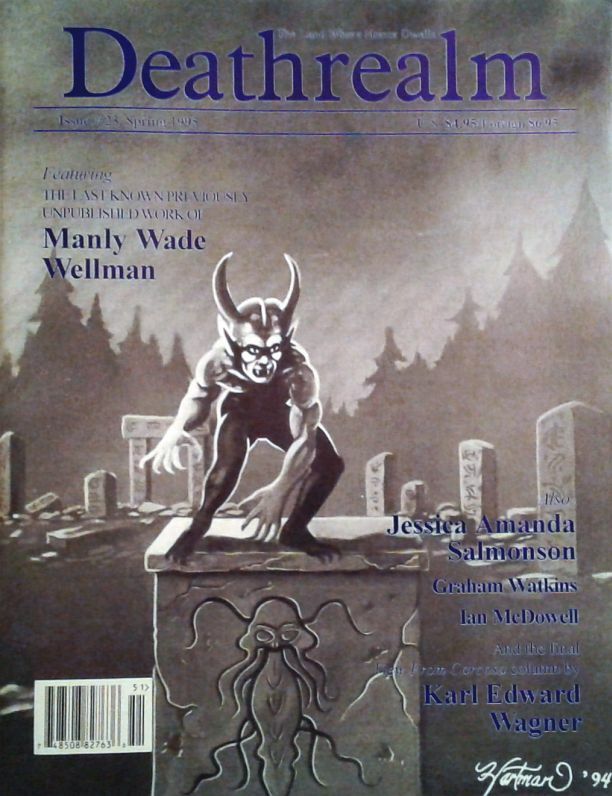 Sadly, in October 1994, Karl Edward Wagner passed away, so Deathrealm #23 featured not only his "gift" of the Wellman tale but the last of his most wonderful "View From Carcosa" columns. 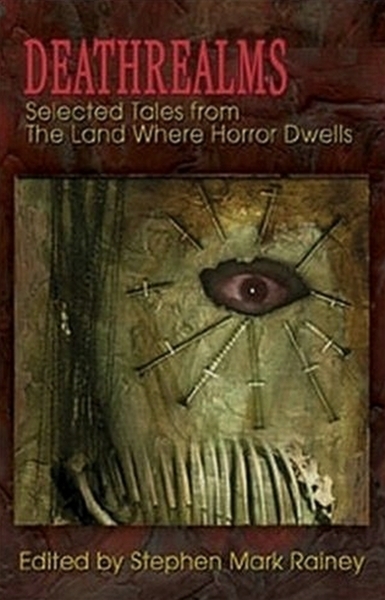 During Malicious Press's ownership, Deathrealm featured fiction, poetry, interviews, and columns by Clive Barker, Poppy Z. Brite, Ramsey Campbell, Douglas Clegg, Don D'Ammassa, Stephen Jones, Elizabeth Massie, Brian McNaughton, Thomas F. Monteleone, Billie Sue Mosiman, William F. Nolan, Tom Piccirilli, Wayne Allen Sallee, Jessica Amanda Salmonson, David Niall Wilson, and many more. Artists such as Michael Apice, Harry Fassl, Lew Hartman, Keith Minnion, Phillip Reynolds, Chad Savage, and many others provided covers and gorgeous interior art. By almost any standard, Deathrealm, now more than ever, was at the top of its game. 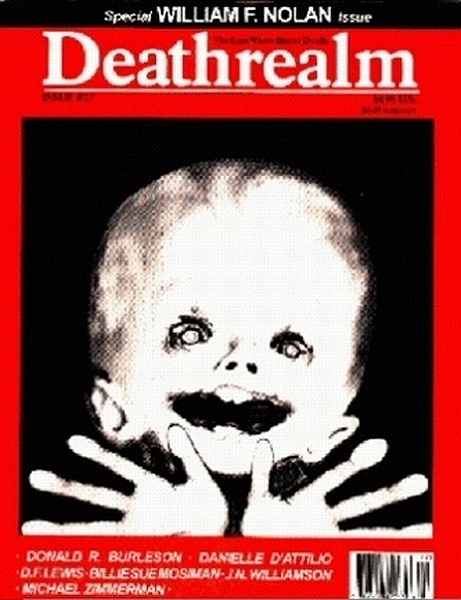 In the spring of 1996, issue #27 featured a cover by writer/artist Ian McDowell (also of Greensboro) that was nothing more than one of his cute baby pictures, altered to be perhaps a little less cute. I loved it. It was creepy yet whimsical. Apparently, however, Canadian customs failed to appreciate the whimsy, for I received word from distributor Gordon & Gotch that the shipment of Deathrealm #27 had been stopped at the border and would not be allowed to enter the country. Now, truly, I love Canada and its people, but I did feel that in this case they might have erred by expecting too much non-horror on the cover of a horror magazine. As it was, some thousand copies of issue #27 ended up in a Canadian recycling bin, as the expense of having them shipped back here, with no place to put them, would have been prohibitive. However, with issue #28, Ian and I had some measure of revenge. He also provided the cover of this issue: another Photoshopped image, but one at least in some measure less disturbing than that cute lil baby picture. This one, happily, presented no problem for Canadian customs. But most gratifyingly, after word got out about the issue being banned, distributor and subscription orders from Canada damn near tripled. Not only that, on the interior back issue page, I ran a large reproduction of #27's cover, so that Canadian readers actually could see what they had been missing a few months earlier. Needless to say, managing the beast that Deathrealm had become was a full-time job, squeezed into part-time hours. Regardless, issues usually came out right on schedule, with a couple of minor delays along the line. However, we were having to work against increasingly prohibitive economic factors. Having fallen on hard times themselves, newsstand and comic distributors were cutting rather than increasing orders. More than one demanded that all distribution go through them, essentially forcing us to put all our eggs in one basket. Subscriptions fell somewhat. Printing prices increased substantially. And then, the coup de grace: Fine Print Distributors, which distributed to Barnes & Noble, our biggest retail outlet, went bankrupt, owing Malicious Press something to the tune of $12,000. This was an amount we couldn't just bounce back from, not to mention putting a huge dent in our circulation. This time, it looked like Deathrealm was doomed. If this had happened five years into its run, I might have decided to regroup and rebuild as best as possible, but after a full decade of it, I was tired. I couldn't essentially start the magazine from the ground up all over again and even think about working on my own writing, which was doing pretty well for me at the time. Once again, the partnership decided it was in everyone's best interest to publish all the material we had purchased and close the doors once and for all. And that was that. The final issue of Deathrealm, #31, came out in Summer, 1997, just over a decade since the first issue had seen the light of day. 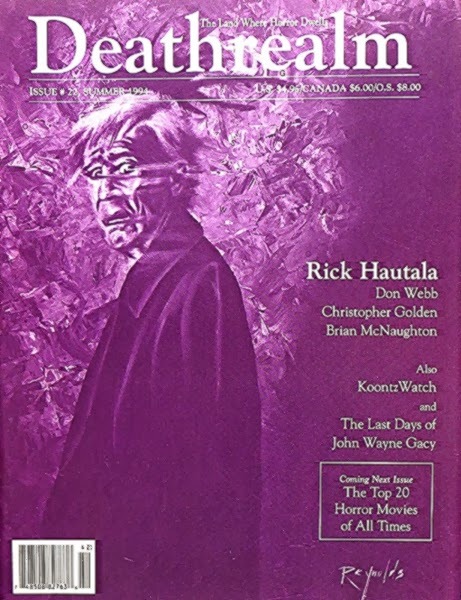 It featured a gorgeous cover by renowned artist Richard Corben, with fiction by Jeffrey Osier, who had almost single-handedly put Deathrealm on the map with his story "Encyclopedia for Boys" in the first issue; Eric Brown; David Niall Wilson; Wayne Allen Sallee; Tim Emsweiler; and several others. 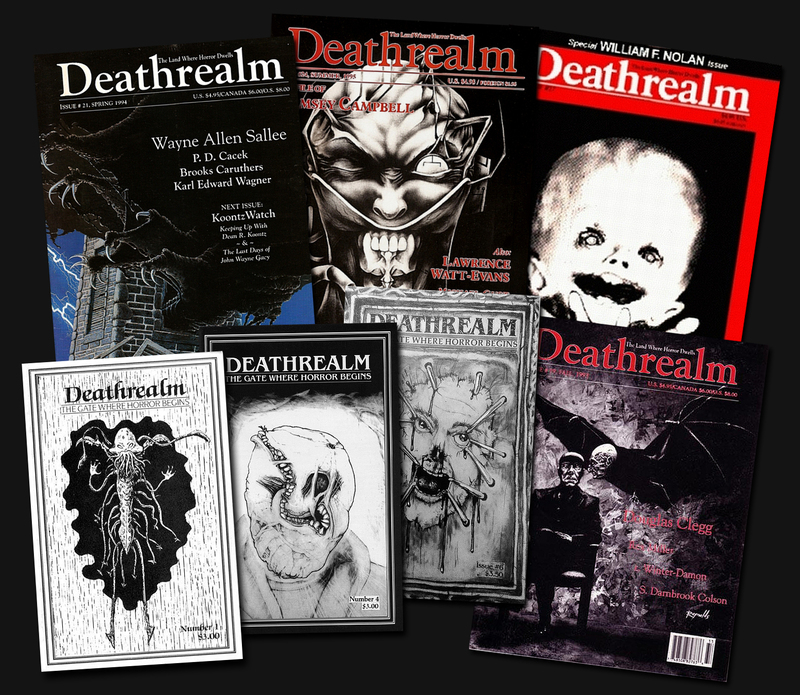 Ten years; 31 issues; hundreds of writers and artists, many of whom had work from Deathrealm go on to appear in numerous Year's Best anthologies; awards and accolades. An endeavor that, now 20 years later, I could hardly be more proud of. 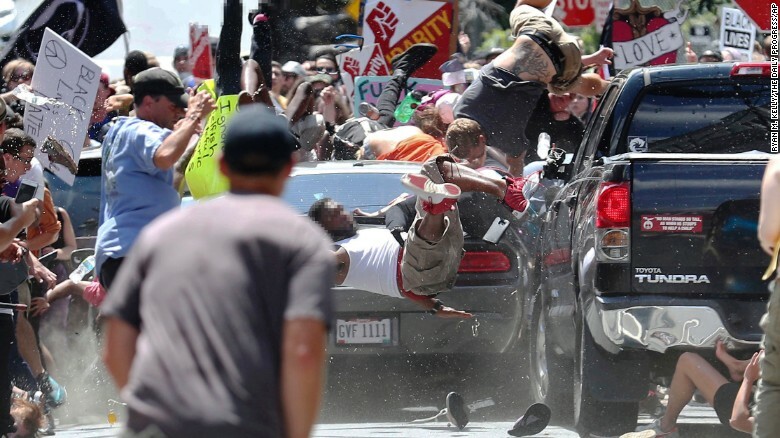 I think there will be one more entry following this one—the aftermath, perhaps some supplemental info, and final thoughts. Bear with me one more time. Deathrealm might have originated as a showcase for H. P. Lovecraft-inspired fiction by a small stable of writers, but that changed the moment the call for submissions went out via Janet Fox's Scavenger's Newsletter. A few days after the first Deathrealm market listing appeared in its pages, my (now ex-) wife called me at the office to tell me our mail carrier had to come upstairs to our apartment door to drop off the mail because it wouldn't fit in our mailbox. Sure enough, when I got home, the sheer number of manila envelopes just about floored me. And that's how it was for the next decade, except during those occasions when reading periods were limited, mostly in the last three or four years of the magazine's run. Early on, regardless of the number of submissions, I made a point to read each one to the end and offer some constructive comments on those I didn't accept. Out of necessity, that practice didn't last long. Anyone who's ever read slush for a publication with more than one reader will certainly understand the situation. The upside of this was that, off the bat, Deathrealm attracted scads of established and/or highly accomplished writers. Many of the authors whose names now regularly appear on bona fide best-seller lists, prestigious awards, and in the mass media cut their teeth with Deathrealm. Before long, I started going to conventions, such as World Fantasy Con, World Horror Con, Necon, and any number of local and regional conventions, where I got to know many of the most prominent writers, artists, editors, and publishers in the field. Perhaps the most valuable fact I discovered from putting so many faces to the familiar names was that these creative folks belonged to a fairly close-knit community, built not only on shared interests but on mutual respect and personal integrity. I still consider a great number of the friends I made my best friends—even if I don't see them as often as I used to, as traveling to conventions these days rarely fits into my personal budget. By this time, the advertising typography business, at least as it existed in those days of yore, was convulsing in its final death throes, and so, after having worked at Alphatype Corporation in Chicago for nearly five years, I jumped ship and went south with Mrs. Deathrealm and the young'un—to Greensboro, NC, where I still live. Thankfully, the small company where I went to work willingly offered the perfect facilities to continue producing the magazine. Because I've always been a proponent of "buying local," I decided to check out the printing facilities in Greensboro to see if they could match the deal I was getting from my original printer (K. K. Stevens Printing in Astoria, IL), and after much searching, I found one that offered a near-comparable rate, so I opted to give it a try with issue #5 (Spring 1988). Unfortunately, the print quality was noticeably inferior to Stevens', and the local printer would not drop-ship copies to Deathrealm's various distributors, so after this ill-fated experiment, Deathrealm returned to K. K. Stevens, and that is where it was printed for the rest of its ten-year run. 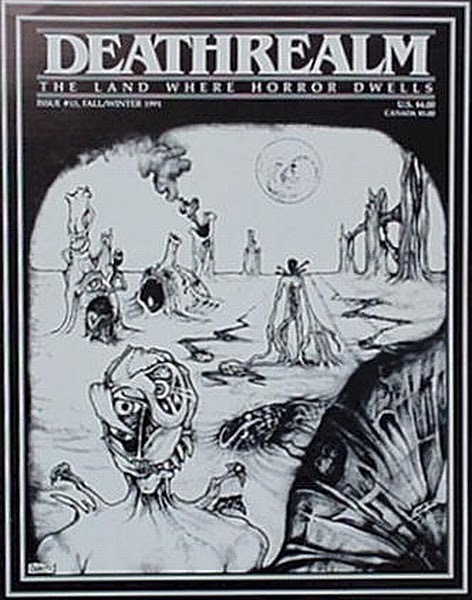 Up through issue #14 (Spring 1991), Deathrealm remained digest-sized, which I personally—as did many readers—always preferred, as it made for clean, comfortable, convenient reading. However, comic and specialty shops were dropping black & white comics and fantasy digests by the score, and newsstands wouldn't touch anything other than a standard-sized magazine. So, with issue #15, Deathrealm made the change to full-size, which gave its circulation a considerable boost, enough to insure its continued existence for the foreseeable future. For my employer, however, whose business was still tied to the now all-but-extinct high-end typography industry, the writing was on the wall. In March 1992, the business shut down, leaving me without employment and the means/finances to continue producing the magazine. Issue #17 (Fall/Winter 1992), was the last issue I produced independently. It was a sad time, as Deathrealm had begun to fare better than it ever had in the commercial market, reviews were consistently good, and more and more writers and artists of exceptional caliber had come on board. Names such as Gary Braunbeck, Fred Chappell, Charlee Jacob, Joe R. Lansdale, Elizabeth Massie, Jeffrey Thomas, and countless others that insured a solid readership regularly adorned the magazine's contents pages. For the next year, Deathrealm languished in limbo, and as time went on, the possibility of a resurgence seemed less and less likely. In early 1993, a gentleman named Stan Tal, who had edited and published a monster of a magazine called Bizarre Bazaar (which featured some of my own fiction), contacted me and indicated he was looking to start up a new horror magazine, but he had the idea that resurrecting one of such solid standing as Deathrealm would make good business sense. Over several months, we hashed out a plan that would put him in charge of publishing, financing, and marketing—in other words, most of the grunt work that had always made actually editing and creating individual issues in timely fashion more than a little problematic. Tal decided that adding a few pages to the overall page count, upping the pay scale, and adding color to the covers would make the magazine all the more attractive to both readers and contributors. I would remain as managing editor and in charge of the physical production of the magazine. We approached noted author and Year's Best Horror editor Karl Edward Wagner to see if he'd be interested in contributing a regular editorial column, which he eagerly agreed to. With these terms firmed up, we set to work on the next issue—#18—which came out under the Tal branding, in summer 1993. Tal went to town getting newsstand distributors on board and increasing subscription orders. I had my hands full hacking through slush piles of mammoth proportions and tackling the production of the magazine on a home PC for the first time. It was around the end of 1993 that I made the acquaintance of Danielle d'Attilio, a local aspiring writer and aficionado of all things horrific. While she had never had anything published, she showed a sharper eye for prose that fit the Deathrealm "mode" than I sometimes had myself. She offered her services as a slush reader, and I happily took her up on the deal. About the same time, writer James Robert Smith, whose work was appearing regularly in both small and big presses, and who was one of Deathrealm's regular reviewers, also volunteered as a reader. Between the three of us, we began cranking out rejection slips—and the occasional acceptance letter—at a record pace. Our little well-oiled machine functioned most efficiently, and the next several issues came out right on schedule. Subscriptions and distributor orders remained consistently healthy. However, not everything was peachy and rosy behind the scenes. While Tal's editorial input was minimal, from time to time, his decisions regarding the magazine's features and mine conflicted, and since he was financing the project, he rightfully had the final word. 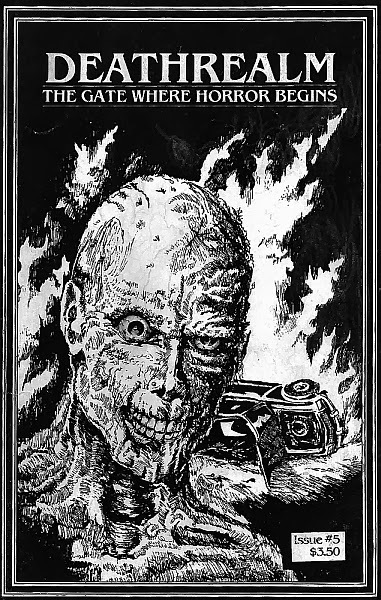 Any number of writers and artists who had contributed to Tal's earlier publications began submitting to Deathrealm, and as a whole, their styles tended to be more extreme—louder—than the more subtle, thoughtful horror that had traditionally appeared in Deathrealm's pages. Make no mistake, I was quite taken with much of it, and without any direct input from Tal, I began including some of these authors in the magazine. Despite the broader circulation the magazine enjoyed, over the years Deathrealm had developed a distinct style, a character, that began to shift and evolve during Tal's tenure as publisher, and readers were beginning to take notice—sometimes quite vocally and oftentimes disapprovingly. Overall, reviews remained positive, but there was a general consensus in the field that Deathrealm had become a rather different animal under its new publisher, and for some, that fact never set well. After just over a year of our Deathrealm partnership, Stan Tal and I came to realization that our respective visions for the magazine were too divergent to continue comfortably, and we agreed that it would be in everyone's best interest to close to submissions, publish all the material we had already purchased, and phase out the magazine on a high note. 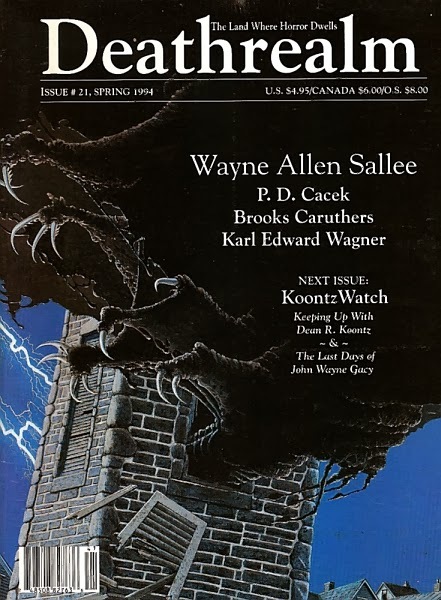 Issue #22 (Summer 1994) was the last issue produced under the Tal brand, featuring some superb fiction by Don Webb, Rick Hautala, Christopher Golden, and Brian McNaughton, with editorial columns by Karl Edward Wagner and Wayne Allen Sallee. At this point, once again, the magazine tumbled into limbo, its future uncertain, but its reputation still strong, its name remaining respected in the horror/dark fantasy field. The first time around this block, I'd had no expectation of an interested party stepping in to take over as publisher, and frankly, I was surprised—and grateful—that Tal had given the magazine another good year. I certainly didn't think it might happen again, especially since I had little interest in actively shopping the property around. So. Do you remember Deathrealm? For the past couple of decades, it's been rare for my thoughts to wander back to the days of that little horror magazine I managed for a ten-year spell... back when I had a bit more hair topside. Now and again, though, reminders of Deathrealm's existence hit me with varying degrees of intensity, and over the past year or so, for whatever reason, those reminders have come around with more than customary frequency, ranging from some writer or artist's random reminiscence on Facebook or elsewhere to the inevitable pointed questions about whether I'd consider reviving the property in some form or another. Since the magazine's retirement in 1997, I've solemnly sworn I'd not do any such thing, at least not as a quarterly publication (the horror stories behind the scenes often put to shame those between the covers). However, this year being Deathrealm's 30th anniversary, a few months back, I actually went so far as to propose releasing the title as an anthology, or series of anthologies, and for a time, the idea actually gained some traction with a noteworthy publisher. Either sadly or not, things didn't come together, but lately I have found the idea of reviving Deathrealm as an anthology series at least reasonably appealing. From the late 1980s through the 1990s, Deathrealm, along with Cemetery Dance and several other publications specializing in dark literature, had a sizable following, regularly won awards, and helped propel any number of authors to the next level of success in the business. In its day, Deathrealm achieved a level of credibility that surprised even its harried, sometimes bumbling editor. The question I keep coming back to now is whether this time might be right for a Deathrealm resurgence. In the intervening years, my life has changed in uncountable ways; my interests have evolved; priorities have changed; and the publishing business has mutated into a whole different beast—not necessarily better or worse, just different. A Deathrealm that might come out in the next few months or years would not—could not—be the Deathrealm of old. And it shouldn't be. These are questions that the bumbling old editor will continue to wrestle with. In the meantime, particularly for those to whom Deathrealm might have been a stranger, here is a history lesson. I'll spread it out over more than one blog entry, as anyone glimpsing too much of it at once might suffer horrible consequences. 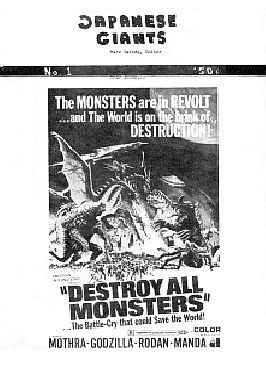 Deathrealm's roots hearken back to my first publishing venture—Japanese Giants, a fanzine about Godzilla and kindred kaiju, which I started in my junior high school years, circa 1974. After producing a single issue, having learned an important lesson about economics, I passed the torch to a couple of other editor/publishers, while still remaining involved in the magazine's production. In the late 1970s, Ed "The Great Entrepreneur" Godziszewski of Chicago, took the helm, and eventually, in the early 1980s, I ended up moving to Chicago, specifically to take my rightful place as one of the official Japanese Giants guys. It was during this time that Ed, co-editor Bill "Wilted Greens" Gudmundson, and I began to expand the magazine's circulation via higher production values and newsstand distribution, and the contacts I made during this period eventually helped make Deathrealm—still years away at this point—a reality. In Chicago, had I met Mike Stein of Filmfax magazine, and the late Bob Weinberg—author, publisher, and book dealer/collector—both of whom proved to be goldmines of information about the publishing business. 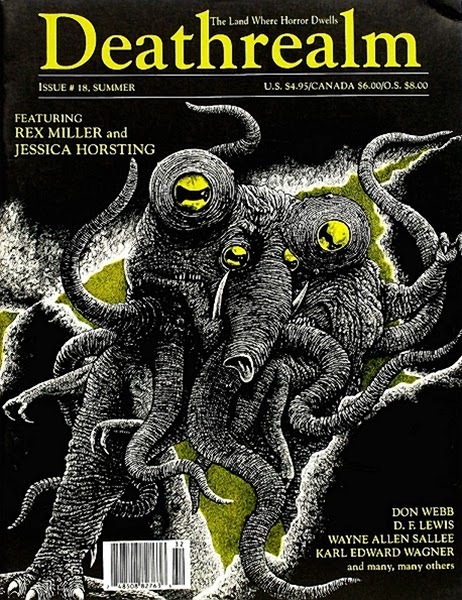 Bob Weinberg's shop carried Robert M. Price's long-lived Crypt of Cthulhu, and having discovered the joys of H. P. Lovecraft some years earlier, I fell in love with the publication. It was Crypt, in fact, that put the bug in my head to start up a fiction magazine. At the time, I worked for a company that manufactured high-end typesetting systems, and one of my jobs was to troubleshoot the machines by typesetting and printing out endless numbers of pages—which meant I had easy access to professional typesetting systems that virtually no other small publisher had. Through Japanese Giants, I had acquired a network of distribution contacts. So, in early 1987, I decided to make the leap and put together a digest-sized publication of original horror fiction. 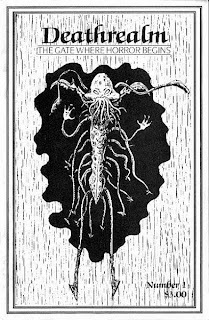 I was already acquainted with Wilum H. Pugmire, a regular Crypt of Cthulhu contributor, via the aforementioned daikaiju circles, so I approached him, and a few other writers I had discovered in Crypt of Cthulhu, to see if they might be interested in contributing to a new horror digest. They were interested. And fellow Japanese Giants guy Bill Gudmundson knew a gentleman named Jeffrey Osier, who had written a horror story called "The Encyclopedia for Boys." I read the story, loved it, and dearly wanted to publish it. This new digest needed a title. I was a fan of the SF anime series Space Cruiser Yamato, and one of the Yamato movies featured an alien space station whose name, in Japanese phonetic characters, came out as Dezarium. To me, the name sounded like "Deathrealm," and to this day I have no idea whether the name was actually meant to be translated as "Deathrealm," but that, I decided, would be the title of this new little horror digest. Done, done, and done. With Japanese Giants, primarily a non-fiction magazine, the editorial "staff" had provided virtually all the writing and artwork, and I knew little about accepted etiquette for fiction publications. My idea was that Deathrealm would be something of a glorified chapbook, featuring some of my own horror tales as well as the work of other writers I specifically solicited. For the first issue, I decided I would include one of my stories called "The Arms of Doom," Jeff Osier's "Encyclopedia for Boys," something by Wilum Pugmire, and a poem (about Wilum) by Jessica Amanda Salmonson. I got a good quote for printing, put out advance notice to the distributors I knew—which netted a good many orders—and set about the production work, which in those days involved endless galley sheets, stat camera images, X-acto knives, rubber cement, and considerable manual labor. In the 1980s, I was pretty prolific not just with my writing, but with artwork, as I had a Bachelor of Fine Art degree from the University of Georgia. I created the magazine cover, did an interior illustration or two, and solicited some artwork from a few other artists who were established in the then-thriving small press horror market. Things were definitely coming together. And at last, in spring 1987, Deathrealm #1 hit the street. It had some honest-to-god comic shop distribution, attracted a sizable subscriber list, and found favor among reviewers. With things taking off on such an encouraging note, it looked like Deathrealm might end up being more than a one-shot deal, so I immediately began making plans for issue #2. I knew I couldn't manage a monthly schedule, but quarterly seemed reasonable. I approached many of the same individuals who had helped put Deathrealm on the map, including Mr. Osier, Mr. Pugmire, Ms. Salmonson, as well as several other folks who had shown serious interest in being published. I again provided the cover art and included my story, "Threnody." I had little trouble filling the contents page this time around, but I began to wonder about how I might fare with upcoming issues. In those days, there was a wonderful monthly market guide, called Scavenger's Newsletter, published by the late Janet Fox, and its subscriber list included a lot of authors whose names I had become familiar with through various horror publications. Following the release of issue #2, I made the fateful decision to open Deathrealm to submissions from the world at large. And for the next few years, my life would never be the same. 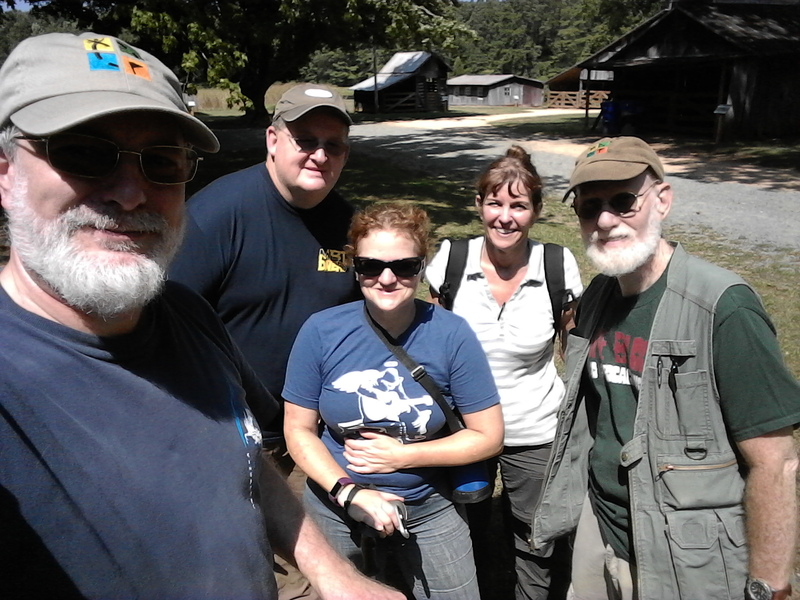 A month ago, on our way to Charleston, SC, with friends, we stopped at Congaree National Park, near Columbia, for a picnic lunch, and while there, we chatted with some of the rangers about the upcoming total eclipse, as Columbia was one of the prime areas for viewing it. They informed us that even then every hotel in the city was sold out for the event, and they anticipated massive traffic on the highways both before and after. It made me very glad we hadn't opted to travel at this particular time. No, I'm so not into crowds that I wouldn't queue up with more than a handful of people to see Jesus if he returned, not to mention anything less momentous. Since our area was in the 95% coverage zone, I was quite happy just to take a few hours off work and make the relatively brief drive down to Southern Guilford High School for the "Almost Blackout" geocaching/eclipse event, hosted by cacher/science teacher Mark Case. A nicely planned and executed event it was, as Mark provided numerous implements for viewing the eclipse, including various projection devices, solar glasses, cameras fitted with solar lenses, and a telescope outfitted to view the sun directly (its surface looks like moldy cheddar cheese). And for attending, you get credit for a geocache as well. A good but hardly oppressive crowd of attendees, too. Just my speed. 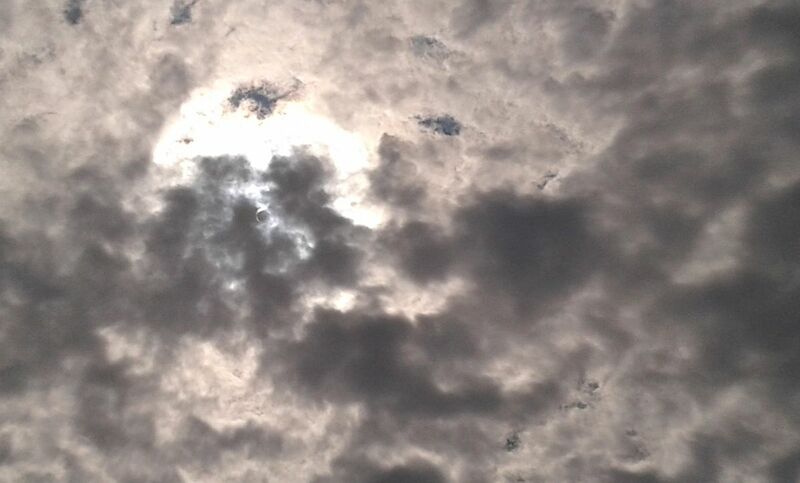 The weather proved reasonably cooperative—lots of clouds, but also plenty of breaks for clear viewing, particularly at peak coverage, and the rain held off until, literally, seconds after the event ended. 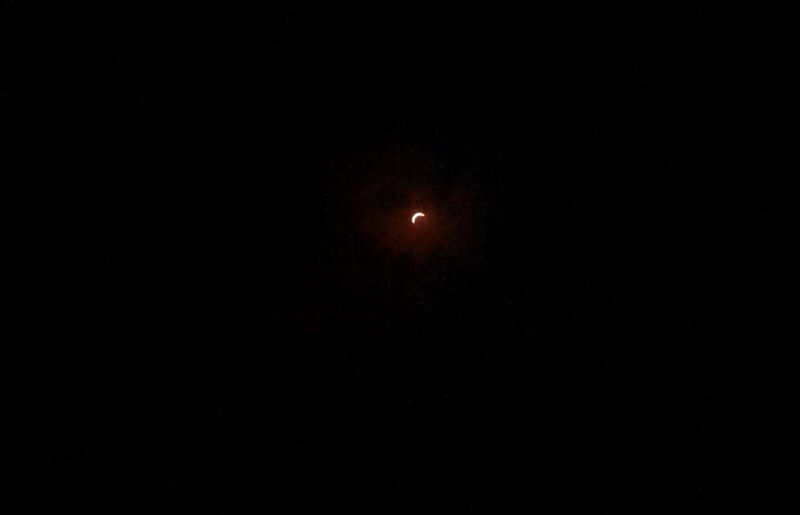 Given my distrust of...well, everything...I risked nothing more than quick glances through the solar glasses, but those glances were impressive. The last total eclipse I remember witnessing was way back in March 1970, when I was ten years old. I made a projector with a sheet of cardboard and a pan of water, and I recall being most impressed by how dark it got. Not dark like nighttime or beneath cloudy skies, but kind of a weird, almost surreal dimness. Today, it didn't get quite as dark as I expected it to, perhaps because we did get only 95% coverage here. The only damper on the day was suffering a migraine early this morning—I've had one of the worst series of them ever in the past couple of months. Fortunately, after the passing of the blinding light shows, the headaches haven't been that bad, and this one never got above a moderate pain level. 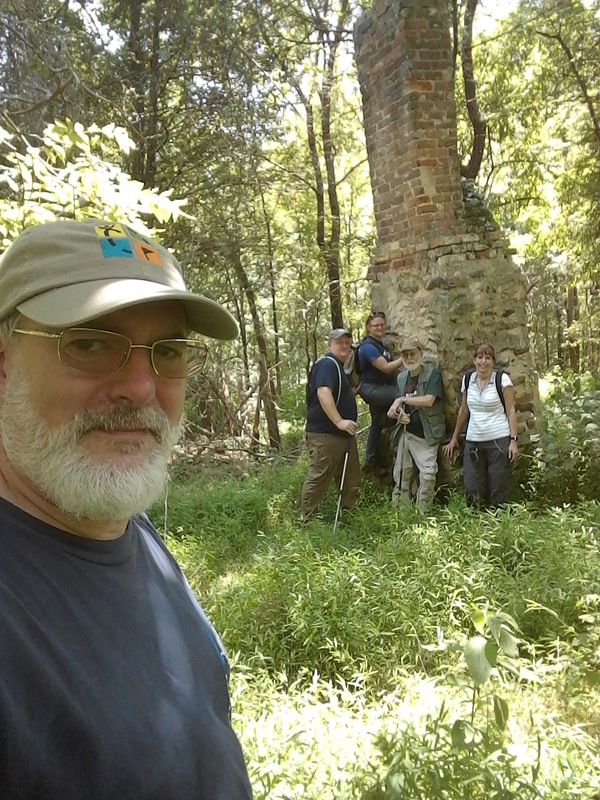 Anyway, I had a nice lunch at Thai Chiang Mai in High Point, claimed a couple of extra caches, and got to hang out with a bunch of good folks at a rare event. You'd best believe I'll take it. And thanks much to you, Mr. Case. 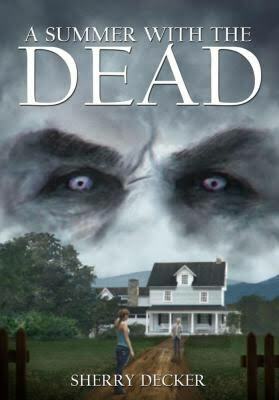 In Sherry Decker's newest novel, A Summer With the Dead, a young woman named Maya Pedersen goes to spend a summer at her aunt Elly's farmhouse in rural Washington state, anticipating a relaxing few months following an emotionally exhausting break-up with her abusive husband. Complicating matters, Maya suffers an array of obsessive-compulsive behaviors as well as occasional hallucinations, which she hopes will vanish as her state of mind improves in the remote, tranquil setting. Naturally, nothing is ever so simple. It isn't long before Elly reveals her own share of peculiarities, including the occasional personality swap with a gruff male Maya comes to call "Mr. Elly." A hired hand, a young man named Coty, appears to take delight in scaring the devil out of Maya, yet she finds herself strangely drawn to him. A fall down a dark well and a desperate crawl to safety through a tight subterranean passage do little to soothe her frayed nerves. As Maya's dreams of an idyllic summer fade, strange apparitions, disembodied voices, and a disturbing sense of some dark presence—or presences—around the farm cause her to further doubt her own perceptions. Coty turns out to be anything but what he initially seemed. And as time goes on, Elly reveals her deepest, most secretive side to Maya, which at first repulses her but eventually comes to fascinate her. As the dark torrents of Elly's life sweep Maya up, the fates of both women become inextricably entwined. Decker's authorial voice is generally strong, especially early in the novel, with an appealing focus on the eeriness of the setting and the gradual deepening of the mysteries around the farm. Her portrayal of the characters leans toward the utilitarian, with dialogue being the primary conveyor of emotion and motivation, mostly to good effect, though at times the characters' laconic responses to increasing preternatural chaos challenge the reader's grip on the tale's internal logic. The climax, while almost cathartic, suffers from too skeletal a rendering of both external and internal conflicts. Despite these occasional weak elements, A Summer With the Dead overall succeeds as an engaging supernatural mystery. Three and a half out of five Damned Rodan's Dirty Firetinis. Runs rampant in the human haze. How hard it is not to hate. How hard it is to hate. I received my contributor copy of Through a Mythos Darkly the other day, and people, let me tell you, this is one big, beautiful monster. 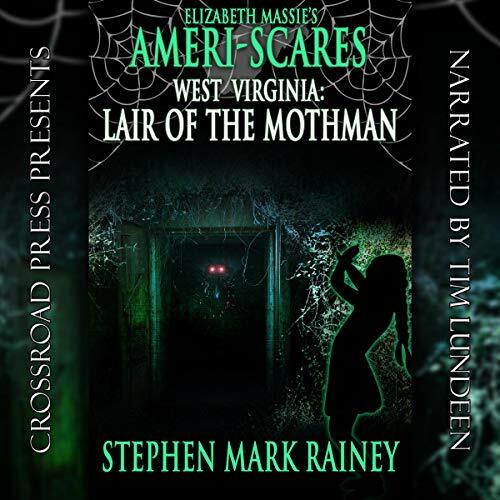 It's from PS Publishing in the UK, edited by Glynn Owen Barrass and Brian M. Sammons, and features my story, "Excerpts From the Diaries of Harold P. Linklatter" (no, not Art Linkletter, you great sillies), along with 16 other tales by the likes of Cody Goodfellow, Jeffrey Thomas, John Langan, Robert M. Price, Pete Rawlik, Don Webb, William Meikle, Christine Morgan, Konstantine Paradias, D. A. Madigan, Sam Stone, Edward Morris, Tim Waggoner, Lee Clark Zumpe, Nick Mamatas & Molly Tanzer, and Damien Angelica Walters. The gorgeous cover is by Tomislav Tikulin. Within these pages lurk 17 stories of alternate history, set in the dark universe of H. P. Lovecraft, kith and kin. Indeed, here you'll find Great Old Ones, Deep Ones, Them Ones, All Kinds of Ones, woven into worlds that might have been or are yet to come. "Excerpts From the Diaries of Harold P. Linklatter" begins in the familiar world of the late 1960s—the day of the Apollo 11 moon landing. And as time moves toward the present day, the world becomes something altogether not the one you see out your window today. It's something much different. Much stranger (and yes, might ought believe that). I must tell you that this book is not inexpensive—£30, (just shy of 40 US. dollars)—but for real, this is just about a dark fantasy reader's darkest dream. In addition to a stellar list of contributors, the packaging is gorgeous and sturdy, with a glossy slipcover around the bound, illustrated cover. 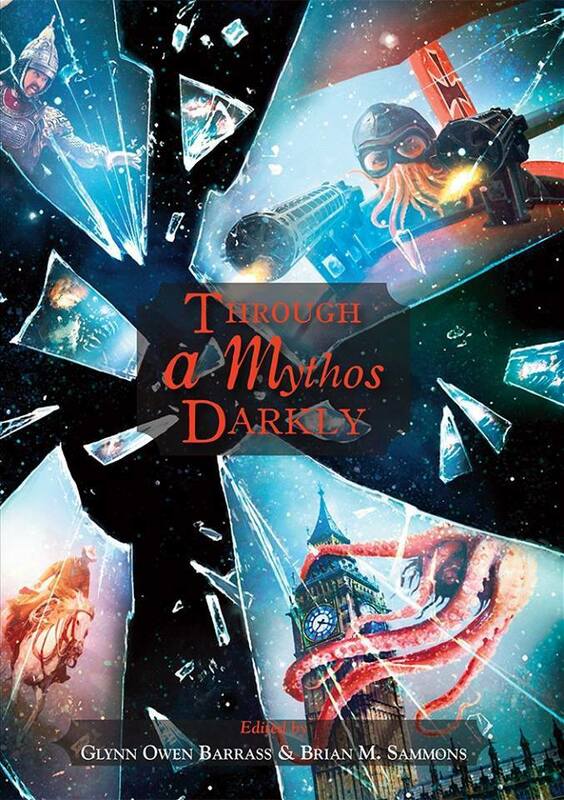 You can pick up Through a Mythos Darkly direct from PS Publishing, and they do take Paypal as well as major credit cards. Dawdle not! not far from "Riley's Rest"
If one is to be coerced into geocaching by a bunch of ne'er-do-wells, one might as well be coerced on a beautiful August Sunday, particularly when it's Hiroshima Day. Today, I was essentially forced to venture out and about with my extended nuclear family—Yoda Rob, Cupdaisy, Robgso, and Suntigres—because there had been wishful blathering on someone's part (not mine... really) about a visit to Hillsborough BBQ Company, which is one of this group's favorite destinations for lunch when out on a geocaching expedition. And so it was, left with little choice but to comply, I transported this crew into the wilds of Orange County between Hillsborough and Durham, targeting some caches in the deep woods, others along the not-so-lonely country roads. Our primary target was "Riley's Rest," GC3N27Z (Note: this web page is viewable only to premium geocaching.com members), a fairly compact little multi-cache at a tiny, ancient family graveyard in the woods not far from the Eno River. There are eight marked graves in this old boneyard, where members of a certain Riley family lie in repose. Five of the graves, marked with rough stones and crudely carved inscriptions, date back to the early to mid 1800s. 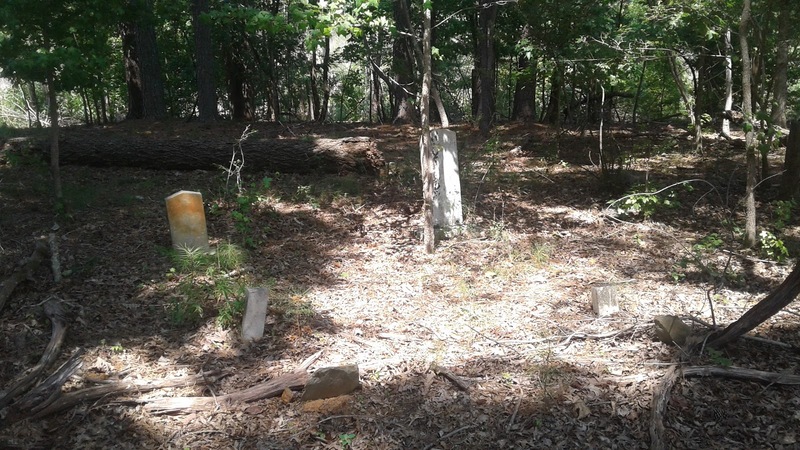 Three of the graves, which have granite markers and more legible inscriptions, date to the late 1800s and early 1900s. To find the cache, one has to find information on the grave markers, do some math, and then go hunt the container, which we found in good condition. 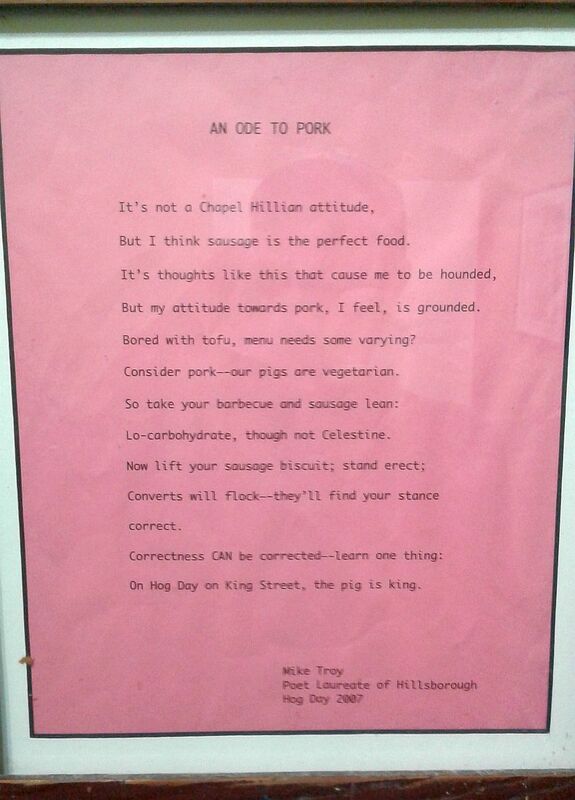 "An Ode to Pork," posted at Hillsborough BBQ Co.
Another of the day's favorite locations we discovered just west of Hillsborough, on an overgown, all-but-abandoned trail at King's Highway Park, which Old Rob and I had visited some time ago hunting a number of now-archived caches. 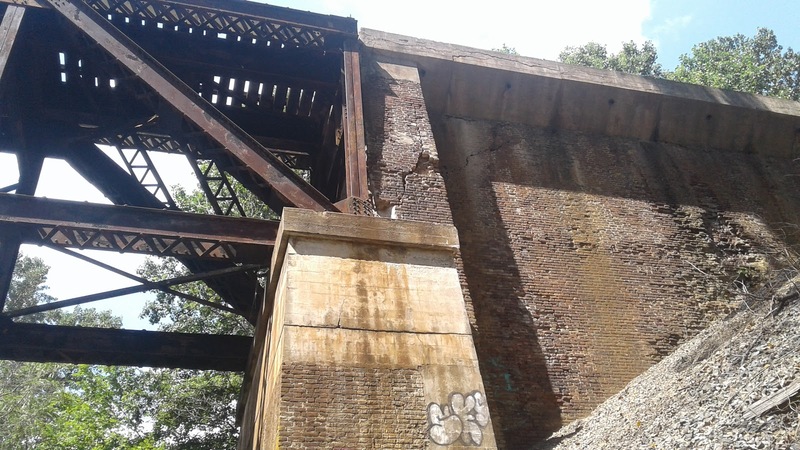 There was a relatively new one here—"King's Highway: Trestle View," GC6GWJ7 (Note: this web page is viewable only to premium geocaching.com members)—that took us to an aging, very high railroad trestle over the Eno. 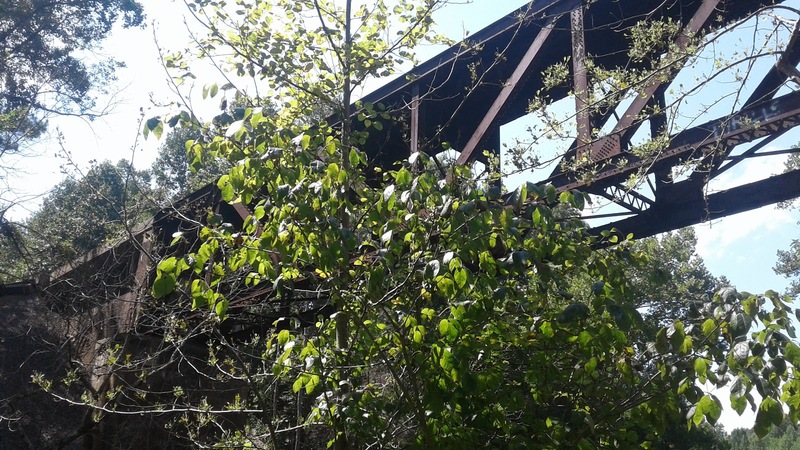 I believe the tracks are still active, but given the evident condition of the trestle, I'm not sure I'd want to be riding on a train passing over it. Luckily for her, Cupdaisy made herself useful and provided us with a nice cache bar today. Captain Morgan's Long Island Iced Tea makes for welcome refreshment after a long, hot hike in rugged terrain. And so, indeed, fulfilling the most ardent desires of this damned, depraved, and deviant nuclear family, we partook of a rather late lunch at Hillsborough BBQ Company. For me, the beef brisket plate, which is dang near unbeatable, and a refreshing concoction of rum, ginger beer, and lime called a Dark and Stormy something or another. It was good, yes. At the end of the day, we picked up 13 caches, bringing my total find count to 9,561. Some people say I have a problem. 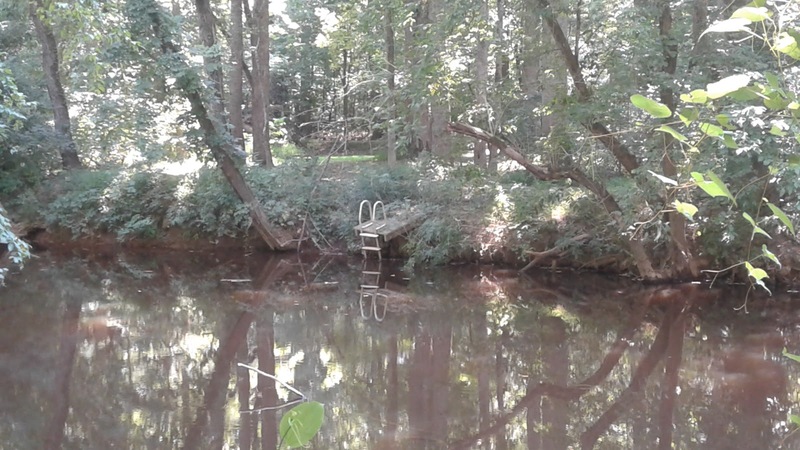 The little graveyard at "Riley's Rest"
A view across the Eno River from "King's Highway: Trestle View"